Holiday adventures should be fun, which Bali Safari and Marine Park provides in full measure, as well as its more profound and enduring mission of conservation. Holiday adventures should be fun, which “Bali Safari and Marine Park” provides in full measure, as well as it’s more profound and enduring mission of conservation. 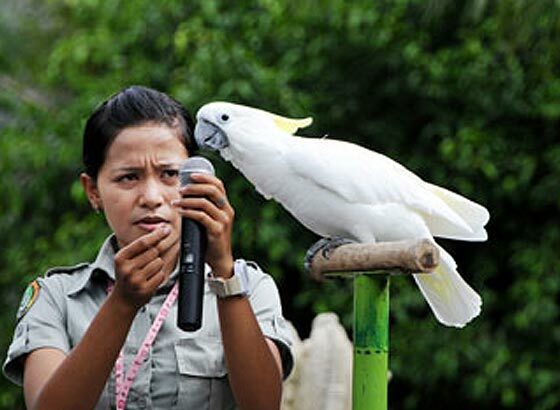 Taman Safari Indonesia is an institution oriented to building tourist attractions that are attractive to visitors, environmentally friendly and that help spread the conservation message. They are the Government appointed Indonesian Center for the Reproduction of Endangered Wildlife and operate the Sumatran Tiger Rescue Team that relocates them when they come into conflict with humans. With the shadow of Bali’s sacred Mount Agung looming in the distance, embrace the rare tranquillity of this retreat as rhinos, zebras and oryx graze contentedly at close range. Savour the raw beauty surrounding the lodge, while lions majestically roar declaring their status as king of the beasts. Coming face to face with many animals, the visitor has the opportunity to see our wildlife living naturally all together in these open range regions and you get to take as many photos as you like, all from the comfort and safety of your air conditioned safari tram, with your very own personal guide! Get “up close” and personal with the animals as they approach your window side. Take pleasure when you plunge into “Lake Manyara” where the Hippopotamus hang out all day to keep cool, get close enough to count the zebra”s stripes, enter the Lion”s den if you dare! Do your best to spot the tigers hiding in the dense jungle and be captivated by the enormous size of our male White Rhinoceros named Nelson. We proudly invite you to come and experience the riches of wildlife right here at the Bali Safari & Marine Park”s beautifully landscaped natural habitat setting that is home to our many magnificent animals. Your personal Safari guides are awaiting your arrival, so please be sure to bring all your wildlife questions along with you and our guides will be happy to help you learn more about the wonderful world of animals the next time you visit us here at the park.